2 "Together stronger than steel"
Leo W Gerard is International President of the United Steelworkers of America. The son of a union minerwho started working at INCO’s nickel smelter in Sudbury, Ontario at age 18, and inspired by a lifelong commitment to economic and social justice, Leo Gerard rose through the ranks of the United Steelworkers of America to be appointed the Union’s seventh international president on February 28, 2001. Under Gerard, the union has heightened its focus on reversing the alarming decline of U.S. manufacturing and the negative impact of it on America’s growing health care crisis. He has worked with equal fervor in developing strategies to inject the rights of workers into trade agreements, investment priorities and corporate governance. Gerard is the driving force behind the Heartland Labor Capital Funds-a network that is creating conceptual, financial and educational tools for capital strategies that will inject the welfare of workers into investment priorities. Leo Gerard claimshe recruited future Obama "manufacturing Czar" Ron Bloom to the Steel Workers union from Wall Street. Bloom represented the Steelworkers during a restructuring of Algoma Steel in Canada, and Gerard says his passion for labor and manufacturing issues was clear. "I said, why don't you come work at what you really believe in?...He could play a lead role in bargaining, play a role in a number of different sectors in the economy and shape policy." 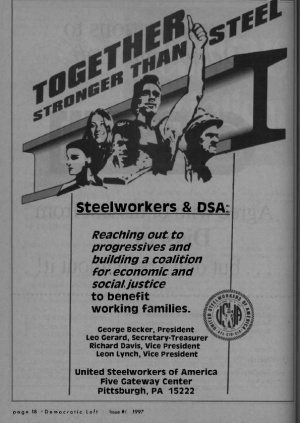 In 1997, USW leaders George Becker, Leo Gerard, Richard Davis and Leon Lynch signed an ad in Democratic Socialists of America's Democratic Left, issue 1, 1997, page 18 "Together stronger than steel". The USWA has a long tradition of militant, good mostly leadership. Now they have someone both militant and radical, which is not surprising as Girard is a Canadian export with ties to the Canadian New Democratic Party. The New Democratic Party is the Canadian counterpart of Democratic Socialists of America-both organizations are Socialist International affiliates. 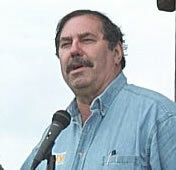 Leo Gerard was elected a vice presidentof the AFL-CIO in 2001 and was appointed to federation's Executive Committee in February 2003. Gerard was instrumental in the formation of the AFL-CIO Industrial Union Council and became chairman chair of the AFL-CIO Public Policy Committee in March 2005. Congressman John Conyers (D-Mich.) hosted a National Health Insurance Conference, April 16-17, 2004 to kick off a 50-state campaign for passage of national health insurance legislation, HR 676 – the “Expanded and Improved Medicare for All Act.” Conyers introduced HR 676 in the House in 2003. Dean Baker, of the Center for Economic and Policy Research, and Joel Segal, senior assistant to Conyers, presented the details of HR 676 in a session titled, “What Is It and How Do We Pay For It?” They will seek to arm the participants to take the message back to the neighborhoods. There was also a session on strategies to promote single-payer legislation on the state level. Activists were working on state single-payer bills in a number of states, including Massachusetts, California, and Pennsylvania. The agenda includes nuts-and-bolts workshops on working with unions, faith communities, educators, and health workers. Ron Gettelfinger, United Auto Workers president, and Leo Gerard, Steelworkers president, both advocates of single-payer health care, were invited to address the conference. The conference also extended invitations to Rep. Barbara Lee (D-Calif.) and Democratic presidential candidate Dennis Kucinich of Ohio, two of the co-sponsors of HR 676. Conference organizers intended to establish a national health insurance citizens’ network to begin implementing a campaign to pass HR 676 or its equivalent. They also hoped to open a national health insurance coordination office in Washington. Dozens of health care and social justice organizations endorsed the conference including Physicians for a National Health Program, the Gray Panthers, Jobs with Justice of Washington, D.C., the National Coalition for the Homeless, the American Medical Students Association, Universal Health Care Action Network, and the National Welfare Rights Union. “We believe that the leadership should come from the people that do the work, and now is the time to build a serious movement for national health insurance for all in America,” asserted conference organizers Michelle Tingling-Clemmons and Rick Tingling-Clemmons. The conference was held at Howard University Hospital and Towers Auditorium, 2041 Georgia Ave. NW, Washington, D. C.
Rep. Barbara Lee (D-Calif.), another panel member, called for “Wellstone Democratic Clubs” to mobilize neighborhoods into the political process to re-order national resources. Many in the audience were students at Camp Wellstone, a workshop conducted in Boston for prospective candidates and campaign workers conducted by Wellstone’s campaign manager, Jeff Blodgett, also on the panel. Rep. Major Owens (D-N.Y.) pointed out that too many liberals, including himself, voted for “welfare reform” in 1996. He praised Wellstone as the lone voice defending welfare at the time. Boston City Councilor Chuck Turner quickly jumped in, igniting the audience with a clarion call for popular direct action to ensure accountability from a Kerry administration. “We need Kerry there and we need to be there to purge the cancer (of the Bush administration) from the soul of the body politic,” he said. When Horace Small, the moderator, pooh-poohed the importance of trade in this election, Jim Hightower, author and radio personality, nearly jumped out of his seat. The program included the presentation of awards to two attorneys, Julie Patino and Nadine Cohen, both of whom have fought difficult battles to protect affirmative action and voting rights of Massachusetts residents and immigrants. Other panelists included Al Franken, media personality, noted Columbia professor Frances Fox Piven and Anna Burger, vice president of the Service Employees International Union. In May 2007 Chicago Democratic Socialists of America honored Leo Gerardwith its annual Debs - Thomas - Harrington award- a privilege usually reserved for DSA members or close allies. The Debs - Thomas - Harrington Dinner Committee does hereby present you with its annual award this 4th day of May, 2007. Leo Gerard serveson the Board of Directors of the Economic Policy Institute-which is led by one time Democratic Socialists of America member Lawrence Mishel. Leo Gerard serves on the Advisory Board of Wellstone Action alongside Frances Fox Piven of Democratic Socialists of America and Robert Borosage of the Institute for Policy Studies. Wellstone Action and Wellstone Action Fund combine to form a national center for training and leadership development for the progressive movement. Founded in January 2003, Wellstone Action's mission is to honor the legacy of Paul and Sheila Wellstone by continuing their work through training, educating, mobilizing and organizing a vast network of progressive individuals and organizations. Leo Gerard serves on the board of the Apollo Alliance, alongside Gerry Hudson of Democratic Socialists of America and SEIU, Robert Borosage of Campaign for America's Future and Institute for Policy Studies, Carl Pope of the Sierra Club and Joel Rogers, founder of the New Party and a past Socialist Scholars Conference speaker. In 2006, Leo Gerard, served on the National Advisory Board of the Apollo Alliance. 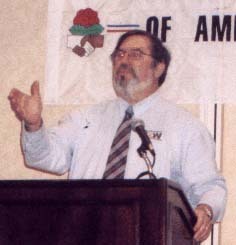 In 2004, Joel Rogers from the Center On Wisconsin Strategy, Robert Borosage from the Institute for America’s Future, and environmental visionary Dan Carol approached Steelworkers President Leo Gerard and SEIU President Andy Stern, among others, to propose a new alliance of labor, environmental groups, business and social justice leaders called the Apollo Alliance. The Alliance, which soon included over 200 supporting organizations, released a report that year arguing for a ten-year program of investment in a “clean energy, good jobs” economy. The Blue Green Alliance sponsors the annual Good Jobs, Green Jobs Conference. The 2009 conference was held from Feb. 4-6, 2009. Leo Gerard signed an advertisement from the United Steel Workers placed in Democratic Socialists of America newsletter, Democratic Left, Winter 2009, saying "Congratulations Democratic Left - The Fight for Justice Continues!" In 2009 Leo Gerard, President, United Steelworkers Union served as a co-chair on the board of directors of Healthcare-Now! . In 2010, Leo Gerard served on the Board of Directors for the Progressive States Network, an organization which seeks to "transform the political landscape by sparking progressive actions at the state level". Leo Gerard was one of the 148 speakers who addressed the 2010 America's Future Now Conference. The fourth floor meeting room of the United Steelworkers national headquarters, in Pittsburgh, rang out with cheers, applause and music Nov. 19, 2012, as nearly 200 friends, family, neighbors, union brothers and sisters and comrades, gathered to pay tribute and celebrate the life of George Edwards. The well known union and community activist and Communist Party USA leader died of heart failure Oct. 5. "George was an activist every day of his adult life," USW President Leo Gerard said. "Even when he was red-baited, he stuck to his principles. He kept up the fight for social and economic justice." Gerard said there was "hardly a dry eye" when he introduced Edwards to a standing ovation at the 70th Anniversary union convention in Cleveland last May. "He was the only person there who was also at the first convention." And, he added, immediately afterwards Edwards threw himself into the campaign to re-elect Pres. Barack Obama, knocking on doors and mobilizing SOAR, the Steelworkers Organization of Active Retirees, which he helped to found and lead. He recounted the fight Edwards had started in 1948 for minority representation on the union's Executive Board and kept pushing for until it was won 30 years later. "At 94, he walked the full distance in the Labor Day parade." Gerard was self-critical that, after the 2008 election, labor had "let Obama down. We should have been in the streets in 2009." But, "we learned our lesson and on election night, we won one for George. We must learn from George's life to never stop being an activist on behalf of working people." Council for a Livable World and the Center for Arms Control and Non-Proliferation hosted an event on Monday, January 21, 2013 celebrating the second inauguration of President Barack Obama and Vice President Joe Biden and theirr endorsed candidates in the 113th Congress. The event was held at the Phoenix Park Hotel ballroom across from Union Station and just two blocks from the U.S. Capitol. A number of prestigious guests attended the event, including Senators Tammy Baldwin, Martin Heinrich, Angus King and Bernie Sanders, U.S. Representatives Suzan DelBene, Lois Frankel and Mark Takano, United Steel Workers International President Leo Gerard, host of The Ed Show on MSNBC, Ed Schultz and Vicki Hansen Thackray from the executive committee of Democrats Abroad. Gary Collins, President of the board of Council for a Livable World, kicked off the celebration with a short speech highlighting the work of the Council during the 2012 election cycle. Signers of New York City Mayor Bill de Blasio's May 12, 2015 launched The Progressive Agenda to Combat Income Inequality included Leo Gerard - United Steelworkers. 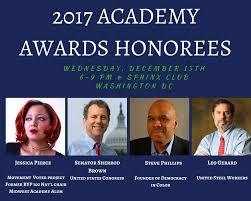 In December 2017 Midwest Academy honored Steve Phillips, founder of Democracy in Color, Senator Sherrod Brown, Jessica Pierce of the Movement Voter Project, and President Leo Gerard of the United Steelworkers. This page was last modified on 24 January 2018, at 19:15.